Dr. Maggie completed her MBBS and Diploma in Otolaryngology (DLO) from Govt. Medical College, Kottayam, Kerala. She did her MS ENT from G.R. Govt Medical College, Gwalior, Madhya Pradesh, India in 1992. She is a Specialist E.N.T. Surgeon, with over 28 years of experience and has been associated with NMC Healthcare for the last 16 yrs. 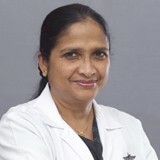 She has previously worked in St. Thomas Mission Hospital in Kerala, India which is a 200 bedded multi-specialty hospital. She was in charge of the E.N.T. department and is experienced in various major and minor surgeries including microsurgeries. She has undergone training in Ear microsurgery from Jubilee Medical College Hospital, Trichur, Kerala and has done fellowship in Functional Endoscopic Sinus surgery from M.C.V. Memorial Hospital, Tamil, Nadu, India. Dr. Maggie has been constantly updating her information and technique to ensure knowledge and compliance with developing trends in Otolaryngology through participation in local and international conferences. Dr. Maggie is a member of the Association of Otolaryngologists in India and Association of Otolaryngologists of Kerala. She can speak English, Arabic, Hindi, Urdu, Malayalam and Tamil.